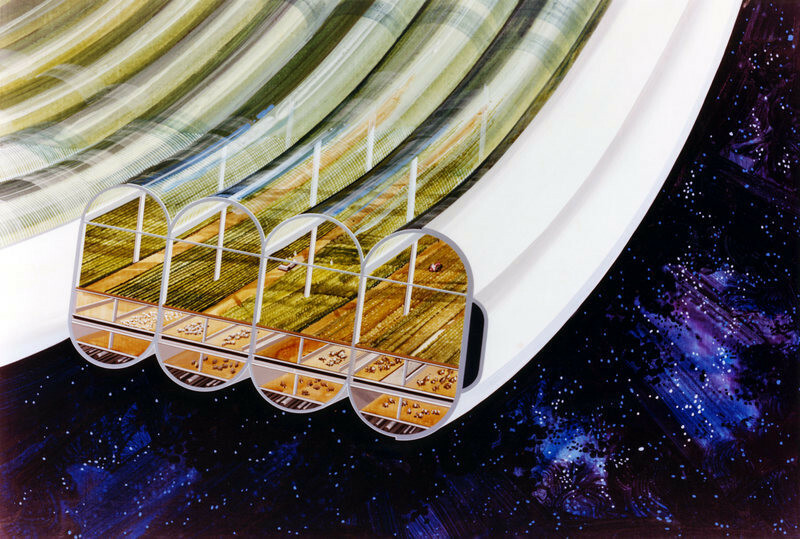 According to NASA and architect Rick Guidice in 1975, this is what Space colonisation would look like. You might think that dreaming up what life in a space colony might be like is at the cutting edge of futuristic thinking. 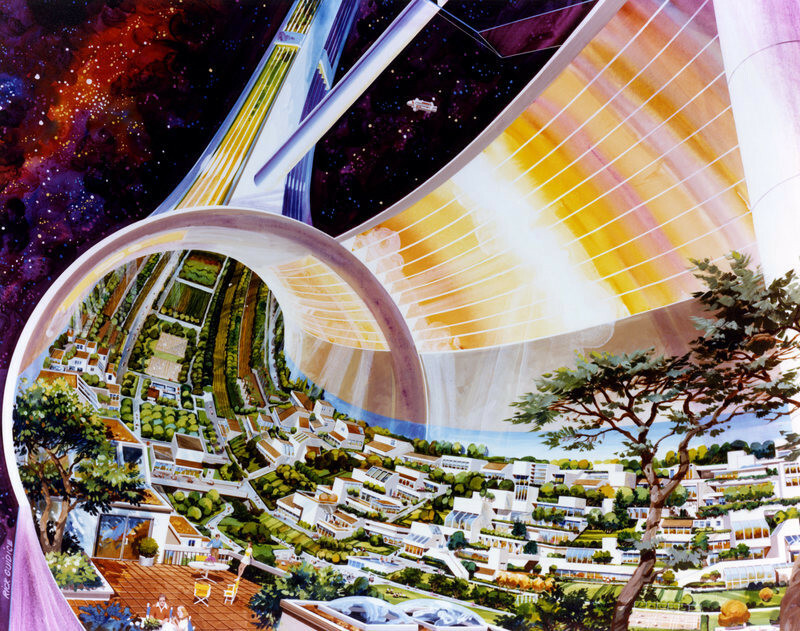 But NASA was working on the concept more than 40 years ago and enlisted the help of an artist to depict how people might live in space in the future. NASA drafted in Rick Guidice to spend 10 weeks working with a team that was tasked with theorizing about future space colonies. Guidice originally trained as an architect and his job was to take those theories and depict how they might look. The vision he created is a combination of hi-tech futuristic spacescapes and idyllic rural scenes. A home from home in space. His drawings capture a sense of optimism and anticipation that may have reflected events at the time. In the US, Nixon had resigned from office, the Vietnam war was finally over, and the first joint USA/USSR space flight – Apollo-Soyuz – heralded the end of the space race. Following the Soviet Union’s launch of the Sputnik 1 satellite on 4 October 1957, the space race ran for almost 20 years, with the USA and the USSR trying to outdo one another at different key milestones. 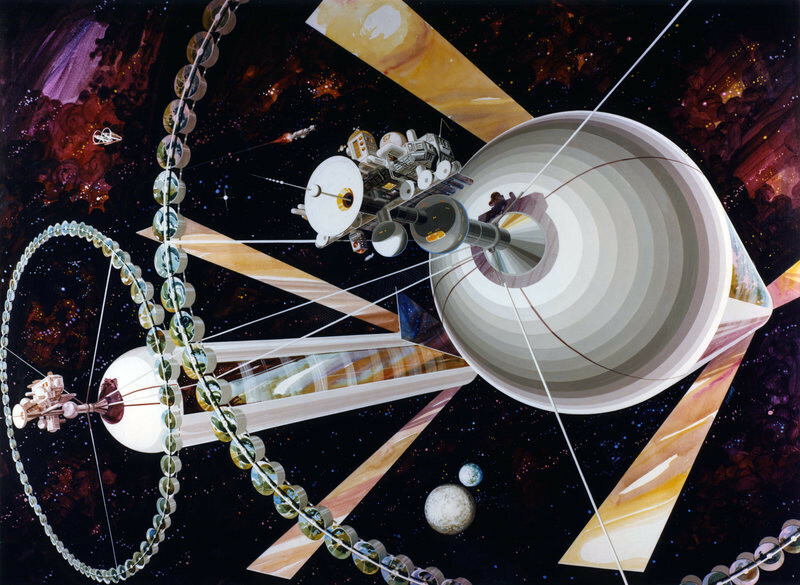 What will space exploration look like in the future? Later in 1957, the Soviet Union sent Laika the dog into orbit, although it would only be 1960 before it was able to safely recover the animals it sent into space. Then in 1961, Yuri Gagarin became the first man in space, aboard Vostok 1. Although lagging behind throughout this early period, the USA was first to the Moon on 24 July 1969. The Apollo 11 mission made superstars of Buzz Aldrin and Neil Armstrong and captured the global public’s imagination. Agriculture formed part of Guidice’s vision for life in space. It may be more than 50 years since the space race was at its height, but interest in space travel is now enjoying something of a renaissance. Private businesses such as SpaceX and Virgin Galactic are at the forefront of a new wave of exploration. Their promises of being able to offer space tourism have recaptured that sense of imagination and awoken ideas of a sustainable future for humankind beyond the Earth.